In the second instalment of our Halloween-themed mini-season, we turn our attentions to another movie about a trio of fabulous, possibly slightly morally compromised, witches. 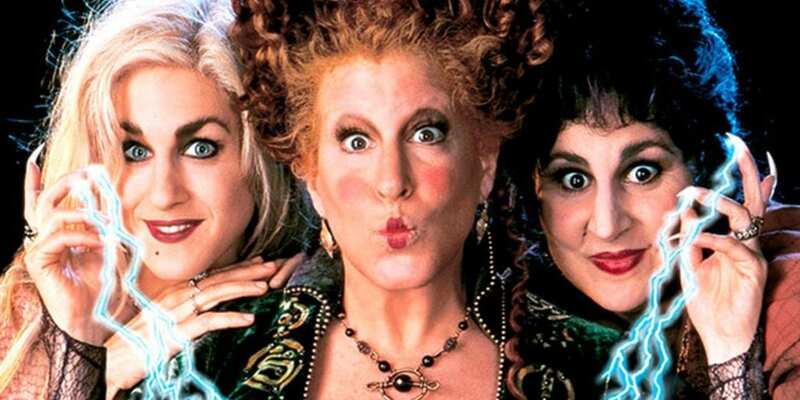 Unlike The Witches of Eastwick’s holy trinity of Cher/Pfeiffer/Sarandon, the Sanderson Sisters, played by Bette Midler, Kathy Najimy and Sarah Jessica Parker are ostensibly the villains of Disney’s Hocus Pocus, but anyone who tells you they spent any part of this movie rooting for the bland teenagers the trio spend the movie terrorising is lying to themselves and you. Bafflingly released in July 1993, Hocus Pocus attracted mostly withering reviews when it was released and sank quickly at the box office. However, over the years, strong VHS (and later DVD) sales and regular Halloween TV airings have helped the movie to graduate from cult favourite to bona-fide classic. The rehabilitation is well deserved, because Hocus Pocus is an absolute hoot – and its is success almost entirely down to Midler. It’s hard to imagine anyone else in Hollywood chewing scenery with the same gusto that she indulges in here. In those pre-Pixar days, some critics felt that mugging her way through a children’s movie was beneath the Oscar-nominated actress, but in a lot of ways it’s one of her best roles, in that it allows her to play to her biggest, broadest strengths. Midler herself has been remarkably loyal to a movie role other actresses of her stature might have tried to brush under the carpet. She consistently cites Winifred Sanderson as her favourite role she’s ever played, vocally champions the long-rumoured sequel and continues to perform the version of I Put a Spell on You she sings in the movie in her concerts to this day. Kathy Najimy and Sarah Jessica Parker more than hold their own as Winifred’s dim-witted sisters, offering broadly comic support to Midler’s campy villainy. Parker’s seductive ballad, Come Little Children, is a genuinely unsettling moment in what can be a surprisingly dark family film (in the opening credits the song acts as the prelude to infanticide), while Najimy gets to showcase her knack for physical comedy with some hilarious set-pieces, including her iconic take-off astride a vacuum cleaner after losing possession of her flying broomstick. As is often the case, the movie’s ‘good guys’ are much less interesting, consisting of a by-numbers moody teenager turn from Omri Katz, a largely thankless love interest role for Vinessa Shaw and a gratingly shrill child performance from a young Thora Birch. Even Thackery Binx, the immortal talking cat is more of a peevish exposition tool than the wisecracking side-character he could have been. He’s probably most memorable to many children for a disturbingly graphic scene in which he’s flattened by a speeding bus. Still, it’s not the teen heroes who made the promotional materials for this movie, and if a sequel ever does get off the ground, it’s unlikely that fans will be clamouring for their return. Like all the best Halloween movies, Hocus Pocus one is all about the villains, and a riotously entertaining 90 minutes for fans of scene-stealing divas who are unapologetically good at being bad. Tune into this week’s edition of Beyond The Box Set using the links at the top of this post to hear Harry and John enjoying a rare moment of shared childhood nostalgia for this generation-spanning Halloween classic, including a very fruitful round of Hocus Pocus drinking games, some hilarious alternative readings and of course our own pitches for what that long-rumoured sequel might actually look like. If you enjoy the show, please consider hitting subscribe on your chosen Podcasting platform for a new episode every Friday morning. Your ratings and reviews are the best way to help us to find new listeners and keep the show going, so anyone who takes the time to write some nice words about is has our undying love and affection guaranteed. You can also get in touch with us via Facebook, Twitter, Instagram or Tumblr if you’d like to suggest a film for us to cover, pitch your own fantasy sequel idea or just say hello.